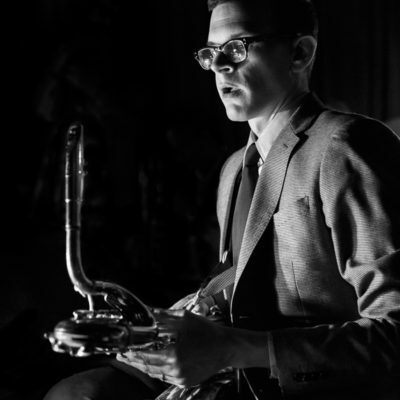 Since moving to New York in 2001, Frank Basile has been fortunate to establish himself as one of today's most in-demand baritone saxophonists. Dubbed a "prized sideman" by The New Yorker, Basile has been called upon to perform with, record with, and tour the world with many of jazz's finest musicians and ensembles. Among this distinguished list are The Vanguard Jazz Orchestra, The Dizzy Gillespie All-Star Big Band, The Jimmy Heath Big Band, The Bob Mintzer Big Band, The Jon Faddis Jazz Orchestra, The Joe Lovano Nonet, The Dave Holland Big Band, Dennis Mackrel's Manhattan Symphony Jazz Orchestra, The Christian McBride Big Band, The Count Basie Orchestra, Michael Bublé, Pablo Mayor’s Folklore Urbano, The Richie Vitale Quintet, The Fabien Mary Quintet, and The Osian Roberts-Steve Fishwick Sextet. In addition to his activities as a sideman and educator, Basile also takes an active role as leader of his own quartet, quintet and sextet. To date, Basile has released three recordings as a leader, and his band has headlined at many of New York's major jazz clubs.